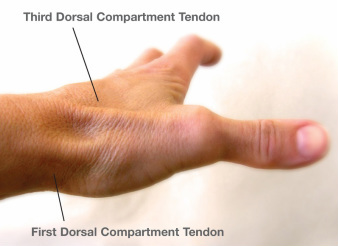 First dorsal compartment tendonitis, more commonly known as de Quervain’s tendonitis or de Quervain's tenosynovitis after the Swiss surgeon Fritz de Quervain, is a condition brought on by irritation or inflammation of the wrist tendons at the base of the thumb (see Figure 1, 1A). The inflammation causes the compartment (a tunnel or a sheath) around the tendon to swell and enlarge, making thumb and wrist movement painful. Making a fist, grasping or holding objects, often infants, are common painful movements with de Quervain’s tendonitis. The cause of de Quervain’s tendonitis is an irritation of the tendons at the base of the thumb, usually caused by taking up a new, repetitive activity. New mothers are especially prone to de Quervain's tendonitis: caring for an infant often creates awkward hand positioning, and hormonal fluctuations associated with pregnancy and nursing further contribute to its occurrence. A wrist fracture can also predispose a patient to de Quervain’s tendonitis, because of increased stresses across the tendons. Figure 1. There are six compartments on the dorsal, or back, side of the wrist. 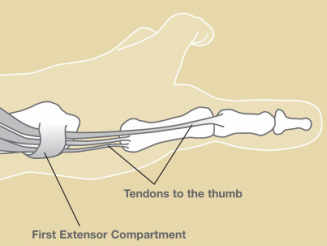 The first and third compartments house tendons which control the thumb. Figure 1A. De Quervain's tendonitis. Pain over the thumb-side of the wrist is the main symptom. The pain may appear either gradually or suddenly, and pain is located at the first dorsal compartment (see Figure 1, 1A) at the wrist. Pain may radiate down the thumb or up the forearm. 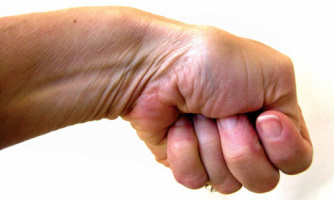 Hand and thumb motion increases pain, especially with forceful grasping or twisting. Swelling over the base of the thumb may include a fluid-filled cyst in this region. There may be an occasional “catching” or “snapping” when moving the thumb. Because of the pain and swelling, motion such as pinching may be difficult. Irritation of the nerve lying on top of the tendon sheath may cause numbness on the back of the thumb and index finger. Tenderness directly over the tendons on the thumb-side of the wrist is the most common finding. A test is generally performed in which the patient makes a fist with the fingers clasped over the thumb. The wrist is then bent in the direction of the little finger (see Figure 2 and 3). This maneuver can be quite painful for the person with de Quervain’s tendonitis. Figure 2. Finkelstein maneuver, a helpful test to diagnose de Quervain's tendonitis. Picture shows the first dorsal compartment relaxed. Figure 3. Finkelstein maneuver, a helpful test to diagnose de Quervain's tendonitis. 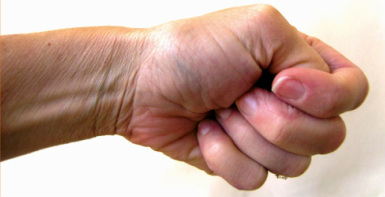 Picture shows the compartment stretched when the fist is bent toward the little finger. The goal is to relieve the pain caused by the irritation and swelling. Your doctor may recommend resting the thumb and wrist by wearing a splint. Oral anti-inflammatory medication may be recommended. Crticosteroid injections into the tendon compartment are another treatment option. Each of these non-operative treatments help reduce the swelling, which typically relieves pain over time. In some cases, simply stopping the aggravating activities may allow the symptoms to go away on their own. When symptoms are severe or do not improve, surgery may be recommended. The surgery opens the compartment to make more room for the inflamed tendons, which breaks the vicious cycle where the tight space causes more inflammation. Normal use of the hand can usually be resumed once comfort and strength have returned. Your hand surgeon will advise the best treatment for your situation.